As always, Samsung took advantage of IFA to make some announcements, especially in terms of wearables this time. 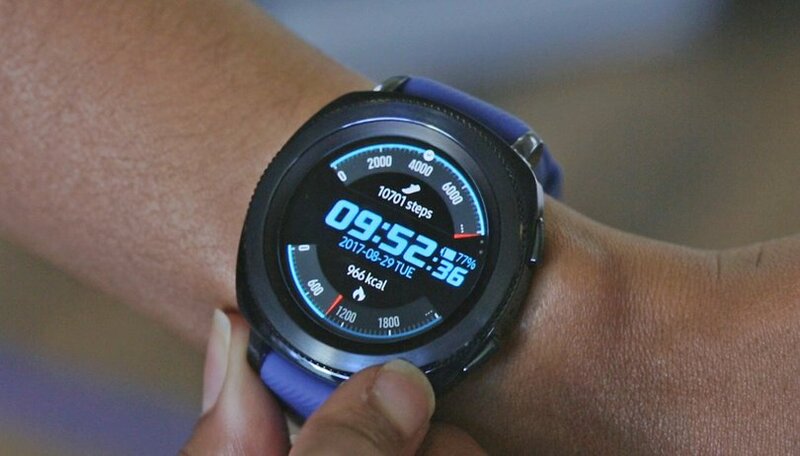 In addition to the new Gear IconX headphones and the Gear Fit2 Pro fitness tracker, the South Korean manufacturer also announced a new Gear S series watch, still running Tizen, called Gear Sport. But what does Gear Sport offer? Find out in our full review below! Just how improved are Samsung's new smartwatches? The Samsung Gear Sport is already available for purchase with a list price of $299. Two colors are available: black and blue. Samsung also offers 23 different 20mm straps made of plastic, leather or a combination of both materials. Other 20mm bracelets will work, too. In the package (in addition to the charger and watch) you can find two straps of different sizes. With this new Gear generation, Samsung shows that it's not abandoning smartwatches as a category. On the contrary, the manufacturer estimates that the market for wearables will double by 2021. That is why, unlike the Gear S3, the new Gear Sport seems to address both a male and a female audience. Its design has been slightly revised to look good on even the smallest of wrists. As a result, the screen shrank from 1.3 inches to 1.2 inches. The dimensions (42.9 x 44.6 x 11.6 mm and 49 x 46 x 12.9 mm) were reduced and the weight dropped (59 g to 50 g). The smartwatch appears more discreet while still retaining a certain elegance. On the surface, the new Gear Sport differs a little from the previous generation. The Gear Sport shares more similarities with the Gear S2 than the Gear S3. The metal body and the accents remain very serious looking, with different aluminum textures, brushed or polished, on different parts of the watch. Of course, the excellent rotating dial to help with navigating the menus remains. Too bad the ring nut (at least in my sample) seems somewhat loosely fitted, although during use it performs satisfactorily, when touched it tends to move and vibrate slightly. This is a pity because the overall quality of the watch is affected. The smartwatch still offers two slightly textured physical buttons, to make them easy to find, on the right edge. On the back of the smartwatch, the Gear Sport still has a heart rate monitor. In combination with the activity measured by motion sensors, it makes it possible to measure calories burned. However, this is an estimate and not accurate data. Finally, you can't ignore the watch band, as it's a big part of the design of any watch. By default, the Gear Sport offers either a blue or a black plastic bracelet (two sizes are included), which are rather nice on the wrist. The rubbery material is comfortable and never irritating. Rest assured though, if you don't like it, any 20 mm watch band will do. The watch adapts both to situations of intense physical activity and is discreet enough to please the fashion-conscious fitness fan.. The Gear Sport features a 1.2-inch Super AMOLED display protected by Gorilla Glass 3. The definition does not change this time, with 360 x 360 pixels (302 ppi). The display is certainly one of the best in this category. Tizen fully takes advantage of the AMOLED screen, with a UI that makes the icons pop on a black background. The brightness is excellent and there's not much of an issue with glare or reflections. The ambient light sensor can help adjust the brightness of the screen, depending on the lighting conditions. The brightness can be adjusted manually to 10 levels despite the presence of an ambient brightness sensor which only serves to lower the level in dark situations. The implementation is a bit confused because there is no real automatic brightness. Thanks to the great contrast between dark backgrounds and light lettering, the readability is great in every situation. With AMOLED technology, you can also use the always visible dial without too much impact on the total battery life. Compared to its predecessor, one of the most important changes to this smartwatch is the addition of water resistance up to 5 ATM. Specifically, the Gear Sport is water resistant up to a depth of 50 m, and it can be taken in the shower or swimming. Diving, however, won't work out. Another cool feature is that the Gear Sport can act as a remote control for presentations or for a Samsung virtual reality headset. The smartwatch is then only compatible with Samsung Pay via NFC (no magnetic stripe readers). You won't find Bixby here (for now), but the older Samsung voice assistant, S-Voice is present to help you with voice commands. Honestly, I don't know if I am happy or not. If Samsung can't offer their own latest voice assistant, compatibility with Google Assistant would have been appreciated. It is possible to place a screen dedicated to workouts next to the dial. From here you can start walking, cycling, cycling and swimming and continuous on-screen monitoring of the heart rate will be activated and GPS will be used to track your route, thus increasing battery consumption. Physical activities are also detected automatically but the results are more an estimate, sometimes it happened that after a game of foosball, my Gear Sport reported I had just participated in a bike race. The watch will also monitor how much time we spend on the chair in the office, advising us on quick exercises to do from time to time. Like the Gear Fit2 Pro, the new Gear Sport features the latest version of the Tizen operating system, 3.0. The interface has been slightly revised, especially the apps menu. However, the use and navigation of the menus has not changed. You still use the touchscreen, the dial and the two buttons. One is used to go backward, and the other to access the menu and return to the home screen. Tizen is sometimes considered better than Android Wear to use, and this new version only confirms my good impression of it. It's simple, easy to use and the watch allows you to easily customize the on-screen dials. Compared to the competition from Google, the only shortcomings are a lack of Google Assistant, and the relative paucity of third party apps. Samsung has focused on fitness for this sporty smartwatch. This is, according to the manufacturer, the main reason for purchasing smartwatches. You can track your calorie consumption throughout the day, your heart rate, the number of steps you take and more. A variety of training programs are available with the new Samsung Health app. If you have a connected TV, it is even possible to broadcast your workouts. Be aware that Bixby compatibility will follow in a later update. This Gear Sport is compatible with Galaxy smartphones running Android 4.3 and higher, Android smartphones running Android 4.4 and higher and the iPhone 7, 7 Plus, 6S, 6S Plus, SE, and the iPhone 5 running at least iOS 9.0. Compared to last year's model, the Gear Sport offers relatively similar technical specs, with a dual-core 1 GHz processor, 768 MB of RAM and 4 GB of internal storage. The watch has Wi-Fi, Bluetooth 4.2, NFC and GPS. The strength of the wearable Samsung wearables has always been the incredible speed and fluidity compared to the competition from Android Wear. During the review period, the watch has always been fast and responsive while maintaining acceptable power consumption. Gear Sport integrates a microphone for voice controls but does not integrate a loudspeaker. It is therefore not possible to use the smartwatch for phone calls. To answer a call from your wrist, you will have to remove the phone from your pocket. As with Gear Fit2 Pro, you can also connect your Spotify Premium account to download music to your watch and listen to it without a smartphone on your Bluetooth headset. The Samsung Gear Sport features a small 300 mAh battery. The Gear S3 battery was slightly larger (380 mAh) but the screen is 0.1 inch smaller, so there's less area to keep powered. Gear Sport offers an energy saving mode that allows you to extend the battery life by deactivating all functions except step counters and clock. I've usually got 2 full days of battery life with the dial always on but without using GPS. If you turn off the dial when it is not in use, you can complete the third day without a loader (provided that you do not use GPS very much) You should not have any problems arriving at night using your smartwatch for prolonged physical activity. Like its predecessors, Gear Sport can be wirelessly recharged on its base which includes a small magnet to facilitate positioning. There are no visible contacts, charging takes place by induction. With Gear Sport, the Korean company confirms what it has demonstrated in recent years with its Tizen platform. The devices that use the proprietary platform are fast, fluid, reliable and have all the main functions to satisfy most users, both sports and non-sporting. Although smartwatch is designed for people who do a lot of physical activity, it is also a great companion for lazy people like myself. The price is not the most affordable, but for a smart smartwatch that looks elegant and adapts to any situation from the gym to an elegant dinner, it's money well invested. The main functions are all there and there has not been a single day when the watch has given me problems of any kind. Coming from a long relationship with Android Wear for me it was an enlightening experience as I realized that the most open operating system is not always the best one. Samsung has made Tizen the real star of this device. All I've seen this week is whether Fitbit OS (Iconic) or Tizen OS (Gear sport) will fill the wearable void for Android users, when will Android Wear step up and fill the void for Android wearables??? Google please get it together !